Why would I put my reputation on the line and say I believe you could ACTUALLY make 7 figures in just 7 years? I’ve reviewed the content thoroughly — and applied several parts of the course successfully to my own business. I’ve met dozens of others who’ve made millions of dollars — it’s a system that’s proven itself time and again. I’ve vetted the author — he’s everything he claims, and he enjoys a sterling reputation among everyone he works with. I see a lot of get-rich-quick plans. Almost every week I’m approached by a would-be wealth guru who has written a detailed scheme to help people “beat the system” and get rich. And almost every week I then have to tactfully decline to publish this person’s “course,” since it has more holes than a screen door. But once in a while, usually when I least expect it, I come across a treasure — not just a diamond in the rough, either, but an exquisitely cut gemstone... a person I simply can’t praise enough. Michael Masterson is a two-carat gem of a man with a clear mission: to help other people get as rich as he is, as quickly as possible. Preferably even richer. And that’s one of the reasons Michael is so successful: he teaches people how they can profit from investments and business opportunities — without profiting off of them. He can do this because he’s already very wealthy and he continues using his own system — the money he might earn from students is worth far less to Michael than the personal satisfaction he enjoys. Imagine how it feels to spread your ideas like bushels of seeds and later watch people harvest their bumper crops. Skeptical? Let me tell you a brief story. A few years back, I flew down to one of Michael’s renowned seminars in Florida. There was quite a crowd in the convention center, and everywhere I turned, I seemed to get caught up in a conversation with someone whom Michael had personally helped to get rich. It was amazing — this throng of people whose fortunes all had been made from one man's system. But I still had the nagging question: What’s in it for him? So I asked. And every time I asked the question, the answer was the same: Absolutely nothing. No percentage. No stake. No take. Turns out, Michael Masterson really is just a guy who developed a simple, foolproof system for getting rich... discovered how great life is when you've got plenty of money... and now gets a thrill watching others take his methods and run with them. It's as simple AND as extraordinary as that. So why do I put my reputation on the line for him? Because Michael is the real deal. A guy who “walks the talk” and trusts his system with his own money, every day. If you really want to become a millionaire, safely but quickly, then read about his system below and give it a try — risk-free, of course. Put Michael’s system to the test, and I'll bet someday soon you'll be down in the Florida sunshine, sharing your million-dollar success story with a soon-to-be-converted skeptic! Along the way, I've shared these steps with many people. Not just any people, of course. Only those who I knew were truly interested in making a lot of money, safely but relatively quickly. And everyone who has followed my little system has experienced the same results I have. And yet... as much as they want to get rich in that timeframe, few of those people think that that's really possible. For example, let's say you're a two-person family with a net worth of $1 million, earning 10% interest. That would yield you an annual income of $100,000. Assuming a 35% tax rate for high earners, you'd be left with about $65,000 per year, or about $5,400 per month. Out of that would come your housing costs, which generally should be about 25% of your income. You'd have roughly $1,350 per month to spend on mortgage or rent. Next, you could figure on about 30% of your income, or about $1,700 monthly, for all of life's necessities like utilities, food, household maintenance and repairs, car payments and insurance... plus a cushion of $300 for the surprises and odds and ends that inevitably drain away your cash. Happily, as a millionaire in our scenario, after all those obligations are taken care of, you'd still have more than $2,000 left over at the end of each month. Take my word, it is very, very nice. And it just gets nicer the further into the millions you get — which, believe it or not, is a relatively easy thing to do, once you've gotten yourself past that first million-dollar mark. And again, the further up into the millions you go, the more amazing the possibilities become. With a $5 million net worth, you'd have about $210,000 extra each year. A net worth of $9 million would yield you about $345,000 in annual discretionary income. So I set out to create a structured step-by-step, wealth-building plan based on the same principles I'd used, profited from, and proven - but this time, with an ultra-specific and highly targeted focus: creating a personal net worth of at least $1 million in seven years or less. There's no dwelling on theory in The Seven Years to Seven Figures System. This program contains the nitty-gritty nuts-and-bolts information you need to start taking decisive action toward getting rich. Prove to yourself it's possible to make 7 figures in 7 years! Order now at a limited-time discounted price! The "aha" moment that forever transformed my ability to get rich - and how it can be YOUR moment too. Once you experience it, the money will literally start pouring in to your life! Where you should be investing your money right now. Major surprises here that you aren't going to read about in the financial pages - including the unsuspected companies that could easily double your money fast. A crash course in real estate investing that will have you raking in piles of cash while you sleep! Fasten your seatbelt and get ready to find out everything you REALLY need to know to make a killing in the real estate market WITHOUT shelling out a lot of cash upfront or spending all your time scanning listings and touring properties. You'll find out where to buy now (and where NOT to)... how to negotiate to win (even if you hate the thought of negotiating)... secrets to assessing a property's true value (so you NEVER pay more than you should)... and so much more. Shed your fears and get in on the incredibly lucrative and SURPRISINGLY EASY (when you do it our way) real estate game. 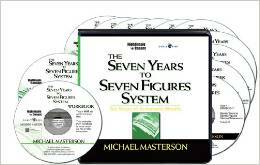 Order Seven Years to Seven Figures System today. YES, I want to have a MILLION DOLLAR net worth in just SEVEN YEARS or less! Please send me Michael Masterson's 10-CD program The Seven Years to Seven Figures System: Six Steps to Automatic Wealth, PLUS Bonus CD and Workbook on CD today for just $98.95 - which is 70% OFF the regular program price. GUARANTEE: If I am not freed from money-related worry and stress in the next 30 days, I will return the program for a full refund. No questions asked.